17Kevin double qualified in the Open division. They started off slow on day 1 but found their rhythm on day 2 finishing 3rd in the 6 team pool. Entering day 3, 17Kevin found themselves in a tough pool; losing twice in pool play knocked them out of contention for a medal. Day 4 proved to be a great day for the team, defeating a very good KC power team and a very athletic Iowa Powerplex team. With the two wins on day 4, 17Kevin won the Bronze division with a final Open finish of 17th place! 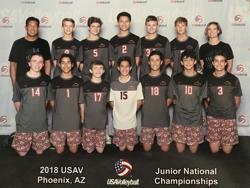 The Elevation 14 Peak Boys team achieved a monumental goal by finishing 15th in the nation in the Open Division at the BJNC. The accomplishment would not have come to fruition had it not been to the hard work and dedication of every player on the team. Given that this team was slightly undersized compared to their competition, the boys had to focus on their fundamentals, in particular passing, defense, and reading their opponents, in order to be successful. They were "underdogs" going in, but ended up rallying together, playing hard, and making a huge statement for Colorado boys volleyball's future! 16Kara also double qualified in the Open division. They entered the tournament ranked 14th in 16Open. Their first day of competition was tough. They pulled out one win and one loss on day 1 setting them up nicely for day 2 of pool play. During day 2 they lost an important match to Metro and fell to 4th place in pool. That 4th place pool finish had them walking into their day 3 pool having to face Houston Skyline & TAV. Although they competed hard, they weren't able to break through their day 3 pool which left them competing for 17th. 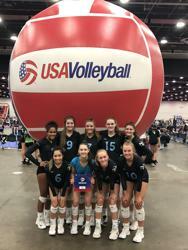 16Kara finished the tournament strong - going out on 2 wins, winning the Bronze Division and placing 17th. 15Shannon qualified in the Open division by finishing in third place at the Pacific Northwest Qualifier. They came into Detroit ranked 19th and finished 19th. They ended up losing the championship match of the Open Bronze Division to Sky High. The team battled against each team, fought hard and lost some close matches. They beat both Instinct and Fortitude day one, and then beat SG Elite on the last day. They were also in a great match with AZ Storm. 15Shannon showed up to battle, it was a good sign of things to come for this team.